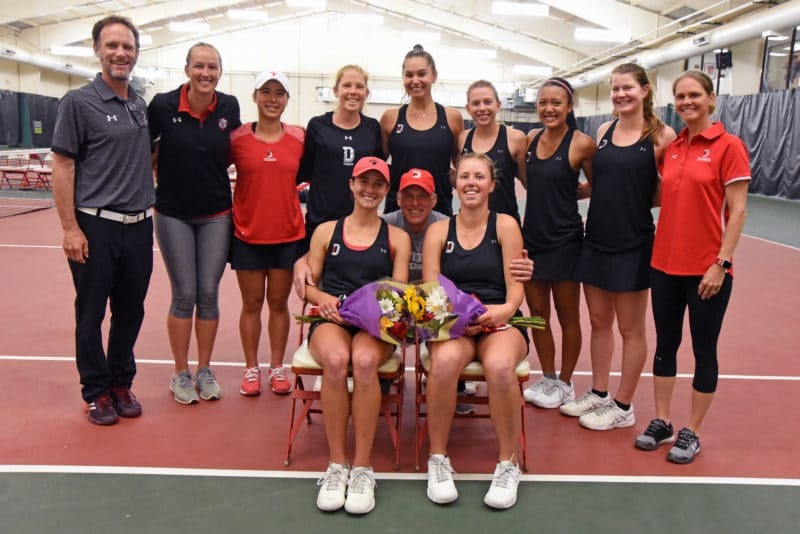 The Davidson Women’s Tennis Team honored their seniors before their match with George Washington. Gabrielle Centenari (front row left) and Megan Scholvinck (front row right). 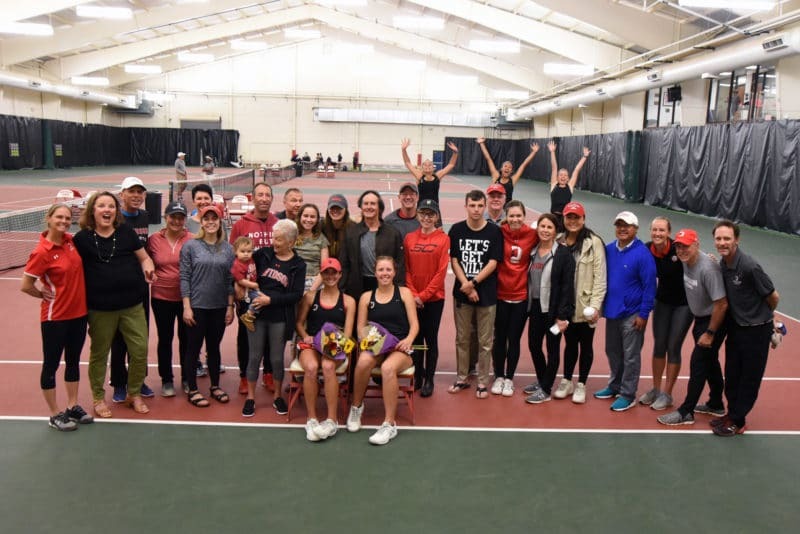 DAVIDSON, N.C. — Playing its final regular season match, Davidson dropped a 5-2 decision Saturday morning to George Washington on Senior Day in women’s tennis at the Davidson Tennis Courts. The Wildcats concluded the regular season with a 12-10 overall mark and a 5-4 record in A-10 matches. It was just the second setback for them at home, as they finished 8-2. GW ran its record to 10-8 with a 5-2 league mark. Prior to the match, seniors Megan Scholvinck and Gabrielle Centenari were honored as they played their final home match of their careers. It was a close battle to start in doubles, with Centenari and Nicole Krykanov cruising to a 6-1 win at No. 3. The victory ran their record to 10-4 on the season. But, the Colonials took the other two positions in very tightly-played matches, winning a 7-5 tie-breaker at No. 1 and then earning a 7-5 decision at No. 2 to grab the first team point. Singles play had two matches go three sets, with both teams splitting those, but ultimately, GW won four of the six spots to claim the win. Centenari made it a successful day when she scored a 3-6, 7-5, 6-0 win at No. 3 for one of the Wildcats’ points. Fellow senior Scholvinck played the other three-setter, and much like her doubles match which went down to a tie-breaker, Scholvinck fell just short in a 6-4, 2-6, 6-4 decision at No. 1. Earning the other team point for the ‘Cats was Alyssa Hahn at No. 6, nailing down a 6-4, 6-1 win for her fifth of the season. Elizabeth Truluck went to a super tie-breaker in her match before falling 10-8 and lost the match 6-2, 5-7, 1-0 at No. 5. It dropped the freshman’s record to 15-6 overall and 5-3 in A-10 matches. Davidson next awaits the A-10 Women’s Tennis Championships, which takes place in Orlando, Fla., starting April 24. Davidson College Women’s Tennis team, family, and friends.